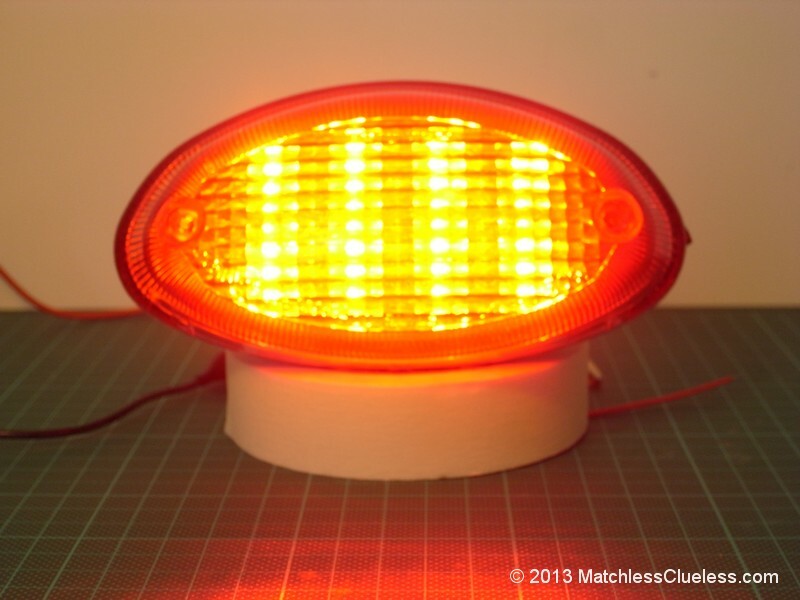 The LED rear lights boards I designed for my old Matchless motorcycle have received quite a bit of interest lately from the guys over at the TriumphRAT owner’s club forum. 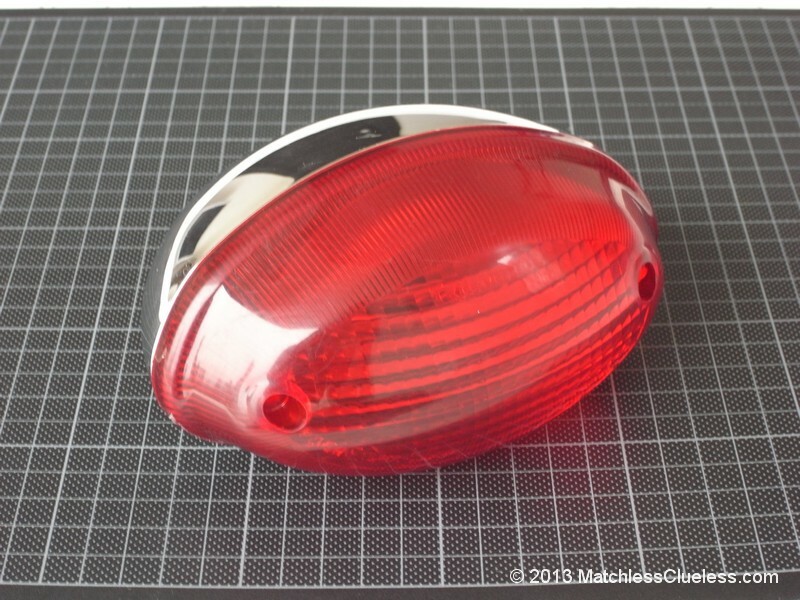 It turns out that quite a few people are changing the standard rear light on their modern Triumph Bonnevilles to the Lucas 564 style light that was fitted to classic Triumphs of the 1950’s and 1960’s. 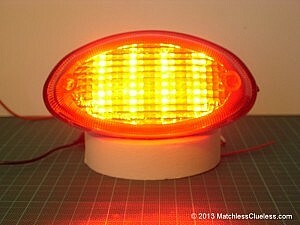 The same rear light unit was fitted to most British motorcycles of the that era, including my own 1951 Matchless. I was approached by a couple of guys off the Triumph forum who asked whether it might also be possible to produce a version of my LED light board for the standard rear light unit fitted by the factory to the modern Bonneville range. 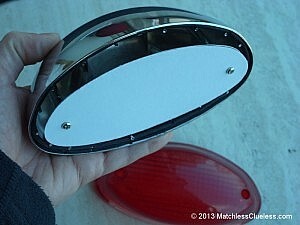 I couldn’t see any reason why not, so one of the guys on the TriumphRAT forum agreed to send me their old rear lamp rear unit to use as a template. This page is going to be a blog of the development of the new LED light board and I will be updating it with new photo’s and info as things progress, so make sure you check back regularly to see how things are coming along. 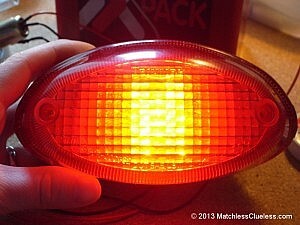 The parcel containing the original rear light unit arrived today (thanks Robin!) so I finally got a chance to have a look inside for the first time. Taking off the red rear lens unit (held in place with two long screws) reveals the inner reflector and bulb holder which is clamped between the rear lamp shell and the red lens. This bit won’t be needed for the LED conversion, but I’ll keep it to one side for now as it will probably come in handy later with positioning the LED board. Thankfully there is plenty of room inside the lamp housing, so I don’t think space is going to be as much of an issue as it was when I was trying to cram everything neatly into the smaller Lucas 564 LED unit I designed previously. The shape of the lens is a little awkward though being a nice rounded oval shape, so that is probably going to take some work to cut the circuit board accordingly for a nice fit snug within the unit. Ok, so some time set aside today to start work on the prototype LED unit for the original Bonneville rear light. 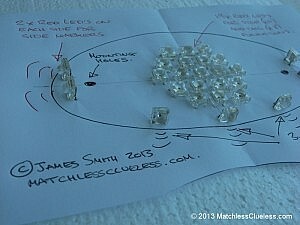 First things first is getting a template made up for the unusual squashed-oval shape of the light. The simplest way was of course to draw around the red lens unit to get the outline shape. I then scanned this in to the computer and started playing around with reducing the size to get a nice tight fit within the silver lamp shell. In the end this required a slight bit of trial and error to get right as the height and width each required reducing by a slightly different percentage in order to give a tight fit all the way round the perimeter. When I was satisfied with the fit, I cut the template out in cardboard to check the fit inside the shell of the light and punched out holes to correspond with the two existing mounting posts. 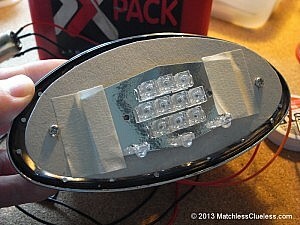 The first template can be seen installed in the rear shell of the light unit in he photo on the left. Initially I thought that the circuit board would sit level with the tops of the mounting posts, but once in place it was obviously too recessed so that the white number plate illumination LEDs would not reach the clear window in the bottom of the red lens. So I tried mounting the template on a pair of 16mm spacers and this looked much better as you can see in the photo. I try and get the LEDs to approximately the same height that the filament in the old bulb would have been at as a rough guide; no particular scientific reason why, that just seems like a sensible starting point. Using the spacers, the red stop and tail light LEDs would be just protruding out of the silver light shell and the white number plate LEDs should line up nicely with the clear window in the lens. I can always experiment with the spacer height later when I have a working board to see what works best. The next job is to give some thought to the number and layout of red LEDs required to illuminate the rear light for the tail and stop light functions. 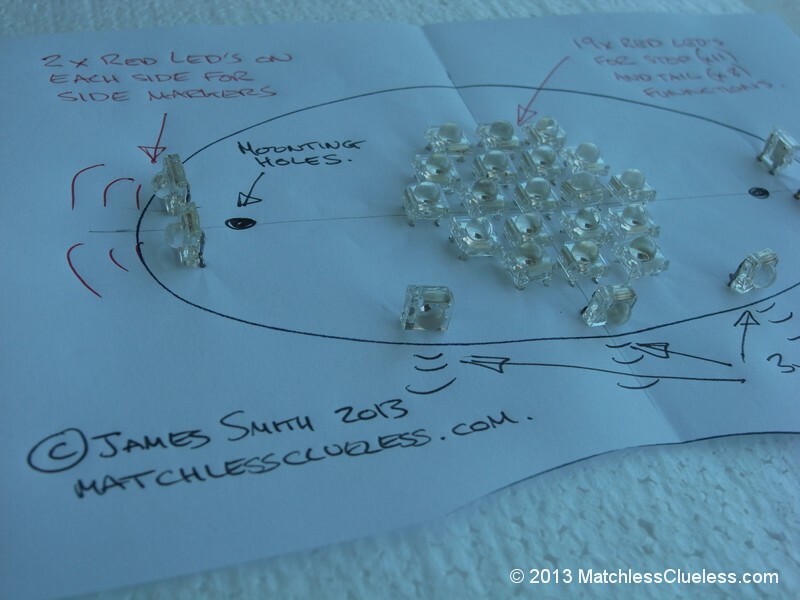 From previous experience with my other LED light boards I know that about 10 of the bright LEDs I use can be used to give the same light output and illumination as a standard 21/5W filament bulb. Sounds a little surprising I know, but you can see for yourself in the photos in my LED rear light comparison blog post. Back over on the TriumphRAT forum, Slackslider used a total of 50 red LEDs for his “DIY LED Tail light with Integrated Turn Signals” project. Actually 30 if you discount the 10 on each side used for integral indicator functions. I think this is probably a little excessive for my light for two reasons. Firstly, a small increase in light output is great but too much is just going to attract unwanted attention from the authorities and also risk blinding following motorists. Secondly, with the circuitry I have developed for running the LEDs on the comparatively dodgy electrics of classic bikes, I am able to run the LEDs safely at their optimum output thereby getting more light for less LEDs. However the light unit is a fair bit bigger than the Lucas 564 unit so I think more LEDs will be required to give a uniform illumination across the whole lamp area. So with a printout of my circuit board template attached to a polystyrene board I set about laying them out in an optimum pattern and the end result can be seen in the photo on the right. The LEDs look a little off-centre I know, but this intentional to align them with the middle of the rear face of the lens (i.e. the position of the standard filament bulb). This isn’t in the centre of the lamp as the top of the red lens actually slopes downwards a fair bit as part of the overall curved shape of the lamp unit. 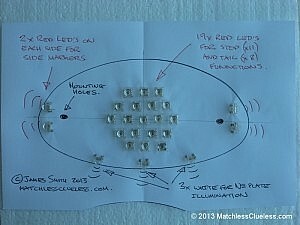 Following the layout I developed for my previous light units, I came up with an array of 19 LEDs in a hexagonal pattern that I think should provide excellent illumination of the rear light. These will be divided between the stop and tail light functions. Previous experience suggests that a ratio of 4:6 LEDs for the tail:stop functions works well, that is 4 LEDs for the tail light, 6 for the stop light and 10 when both tail and stop lights are on together. 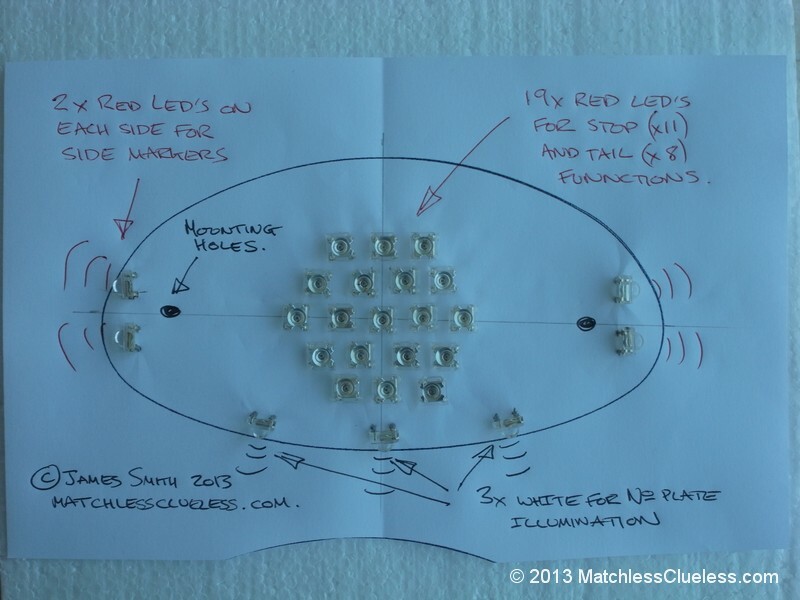 This arrangement outperforms a standard 21/5W filament bulb in my Lucas 564 light boards. 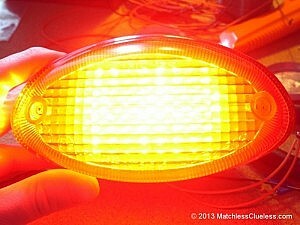 This would equate to about 8 for the tail light function leaving 11 for the stop light function if we had a total of 19 LEDs. Off course this will need some testing with the first working prototype, but is I think a good starting point. Below the array of red LEDs you can see the three white LEDs that are pointed downwards to provide the number plate illumination function. 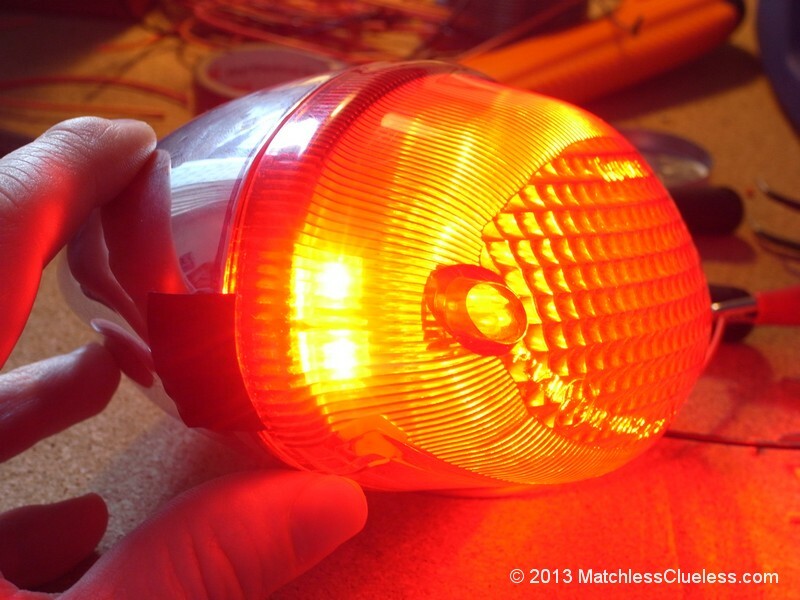 These will be linked to the tail light function so they come on when you turn on the side or head lights. Whilst locating these white LEDs a thought occurred to me: Why not added a couple of red LEDs on each side pointing out sidewards to provide increased visibility for the bike at night from the sides? This idea was somewhat inspired by the headlights on some of the newer BMW cars, maybe the 3 and 5 Series, where the headlights seem to contain a couple of additional orange LEDs that point sideways to provide additional side markers. I haven’t tried this idea out yet, but there’s plenty of room for them inside the Bonneville rear light unit so I think it’s certainly worth a try. You can see the two pairs of side LEDs in the photo on the left. Today’s task was to test out a couple of ideas with the Triumph rear light unit and make a first prototype to get an idea how it looked. First plan was to install one of my Lucas 564 LED boards within the Bonneville rear lamp to get a feel for the number of LEDs that might be required and how they illuminate the lens. So I simply attached the LED board to one of my cardboard templates with some masking tape and wired it up, as you can see in the photo on the right. You can see how much bigger the standard Triumph rear light unit is as the LED board is normally a tight fit within the classic 564 rear lamp. 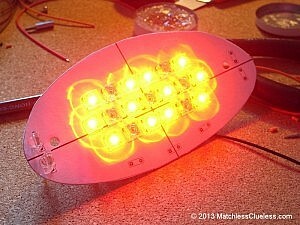 The picture below shows the Bonneville lamp with the brake light LEDs lit. It’s pretty hard to take a good photo looking straight at the bright LEDs so please don’t read too much into the apparent brightness as I had to adjust the exposure to get a reasonable picture. My conclusion was that the LED brightness is good, but the area of illumination is far too restricted at the centre of the lens and so a larger array of LEDs would be needed for the Bonneville light board. In particular the side-to-side coverage would need to be increased, but the top-to-bottom coverage seemed fine with just three rows of LEDs. I guess the lens pattern does a better job of diffusing the light in the vertical plane than it does in the horizontal. Based on this, I decided to trial a wider array of LEDs that in my original design sketches above for the first prototype. Transferring my circuit board template into the PCB design program took a good few hours thanks to the unusual squashed-oval shape, but once in there it was an easy job to lay out some LEDs and print out a template for a first working prototype. The template was glued to a piece of card, cut out and holes pierced for the LEDs which were then pushed into place. A bit of handwork soldering some wires on the rear side an I had my first working prototype! 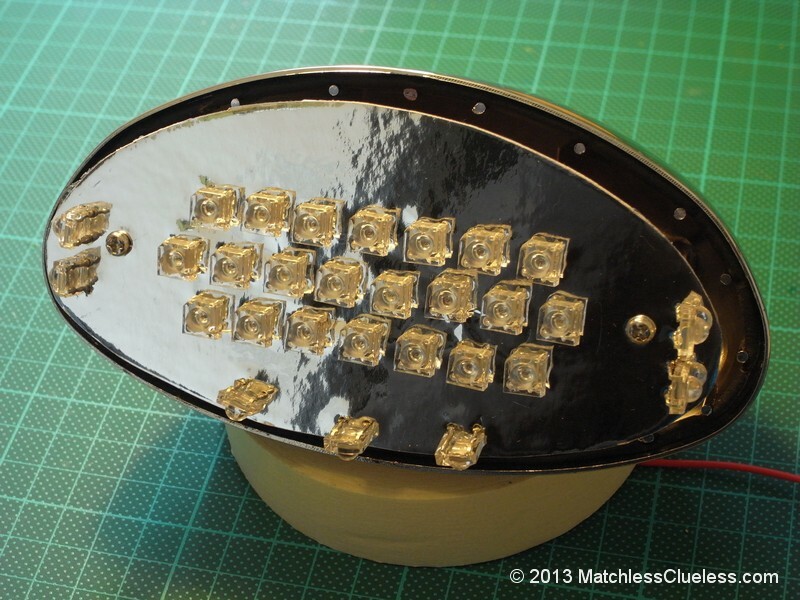 The picture on the left shows this first prototype board installed in the Triumph lamp housing. It uses 7 red LEDs for the tail light function and 12 for the brake light (as shown illuminated in the second photograph down) giving a total of 19 LEDs in the main array. In addition, I included two 2 red sideways-facing LEDs on each side of the board to give extra visibility when the bike is viewed from the side as per the idea I described earlier. There will also be 3 white number plate illuminating LEDs across the bottom of the light board, but I haven’t bothered fitting these to these early prototypes. The third photo down shows the rear lamp with the red cover in place and all 19 of the stop and tail light LEDs lit. The brightness is pretty good as you can see, but I’m still not completely happy with the side-to-side distribution of light that gets diffused by the plastic lens. This seems to have quite an unusual pattern to it, at least compared with the classic Lucas lights I’ve been working with previously, with lots of little curved windows. These seem to do a good job of diffusing the light vertically, but keep it relatively focussed horizontally. You can see in the photo that the extreme left and right sides of the lens are not too well illuminated, but I think this is pretty reasonable when the light is viewed from directly behind. However when you view the light from off-centre, the less well lit area on the farther side of the lens grows – and that’s the bit I’m not quite satisfied with at the moment. Just goes to show that theory goes out the window when you actually start truing things out in practice! So I think I’m going to need to increase the number of LEDs slightly to improve the light spread at the sides of the Bonneville rear lamp. Probably an extra column of three LEDs should do the trick, so that will be the plan for the next prototype unit tomorrow. The last of the pictures on the left shows the two extra side-facing LEDs I included to give a sort of sidelight function when the bike is viewed from either side. I think this actually works really well and serves to improve the angle of view of the rear light, giving an extra feature that the standard filament bulb unit doesn’t have. So I think these will definitely be staying! Yesterday’s initial prototype was quite a success, but just needed a few extra LEDs to complete the illumination at the far two sides of the rear light. So back to the computer and a quick tweak of the design adding an additional column of 3 red LEDs and bringing the total number in the main light array up to 22 – 8 for the tail light function and an additional 14 that light when the brakes are applied. The top picture on the left shows the new and improved prototype. I’ve also included the mirror finish coating to the board on this one that will be used on the production boards, although in hindsight this made it even more difficult to take a good picture of the board to show you! The second picture down shows the illumination of the rear lens with only the 8 tail light LEDs on. As I’ve mentioned before, it’s incredibly difficult to take a good picture of a bright LED so I’ve needed to adjust the exposure to compensate so its not just a red blur. Also note that these pictures were taken during the day with a desk lamp shining down onto the rear light directly from above in order to try and brighten the rest of the photo by reducing the relative brightness of the LEDs. So the LEDs are actually even brighter than they appear in the pictures. You can see the pattern created by the LEDs in the lens when just the tail lights are illuminated. It looks like 4 vertical stripes across the light which I think looks pretty cool and different to the overall dull glow you’d get with a standard bulb. The other nice effect you get with the odd diffuser design of the Triumph lens is that the stripes appear to move left and right as you change the viewing angle which will hopefully make the rear light even more noticeable to other motorists. 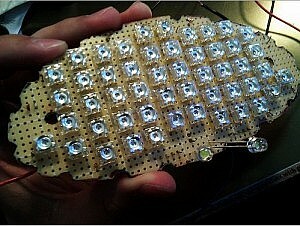 The bottom photo shows the light with all 22 of the red LEDs lit at once for the tail plus brake light functions. It’s really bright and the illumination is nice and even across the full width of the lens, even when viewed from off-centre. 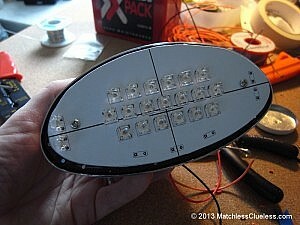 So it looks like those 3 extra LEDs I’ve added since the last prototype have done the trick! So here’s a quick video I’ve just shot demonstrating the prototype light board. Hope it gives you a better idea of how bright it is and the illumination pattern for the stock Triumph rear light lens. That’s about it for today I’m afraid, but please check back again soon for more updates. You can leave me a comment below with your thoughts, ideas and suggestions for the development of this LED light board – always good to hear from you! I now have the circuit board outline programmed into the design program I use so now I can get working on the circuitry to connect and control the LEDs. I’ll hopefully be able to get that done later today, or maybe tomorrow. Then it’s just a case of waiting for the new CNC machine I’ve ordered for cutting out these unusual shaped curved boards to arrive (no doubt it’s been held up by the Lunas New Year holidays here in Hong Kong) and then things can really start moving along with the first production board being produced for testing. 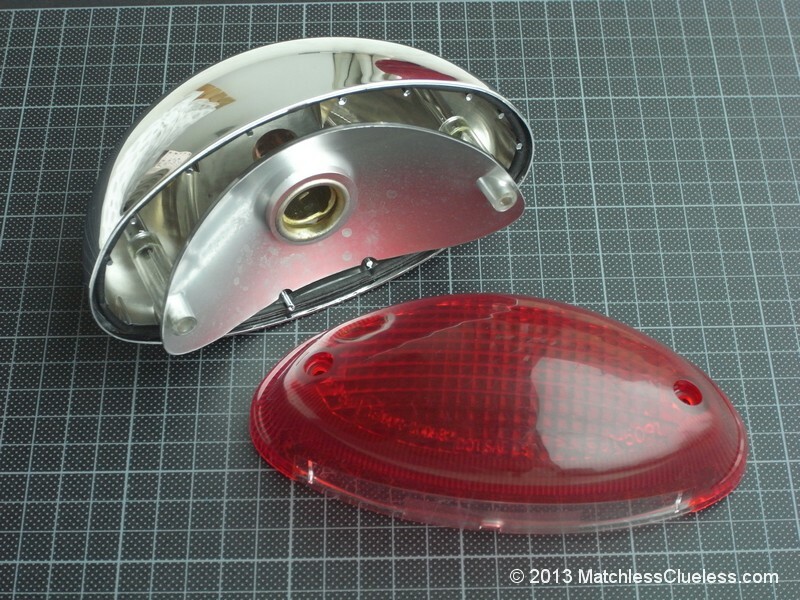 Hi James I have a 2014 Triumph Thruxton and interested in purchasing the 22 LED rear tail light conversion kit. I noticed on the website it said on backorder. Can you provide an estimated date of when you think I can make a purchase? Thank you, Scott in Bethlehem PA USA. Hi Scott. I finished redesigning the new Bonneville LED board a couple of weeks ago, so it is now just a case of putting it into production. This should take about 6-7 weeks as I am having the circuit boards manufactured at a specialist company in the UK which takes 3 weeks, then its a week or two for the to ship back to me and another week for me to get the first batch assembled and tested. The new design looks basically the same as the original, but there are quite a few improvements and tweaks to the circuitry to improve brightness, safeguard the LEDs if it gets accidentally wrongly connected, and that sort of thing. The biggest change is that all of the LEDs now come on for the brake light function, even if the tail light is not on. So that makes the brake lights even more visible in during the day. You can place a backorder now if you like and I will add your name to the list of people for the first batch of LED boards. I think you’ll be very pleased with the new boards, they’re even better than the old ones which were already the best and brightest LED option available anywhere for the new Bonnevilles! Hi again Scott. Just tried to email you but this seems to have been blocked by your email service provider for some reason. If you can drop me a message with an alternative email address I will send you a mail when I have a firm delivery date for you. I am planning to go with all LED signals and brake lamp unit on my 2012 T100 Bonneville. I am already running an LED/Filament compatible brake light flasher control (BackOff XP) and turn signal self-cancelling relay (SignalMinder) which is LED compatible also. Finally, I think my bike already has LED instrument warning lamps. Do I need to order the diode & relay parts to fit your turn signals & brake lamp unit? If the dashboard indicator warning light is already an LED then you shouldn’t get any cross-talk and hence the diode modification is unnecessary. However if you’re indicator flasher unit is a standard one designed for filament bulbs, then it might not work or else flash at the wrong speed when LED indicators are fitted. So you may need to change the indicator flasher relay. The fact that you ride a Matchless is enough for me, as my last one was a Matchless Scrambler G80cs many years ago. 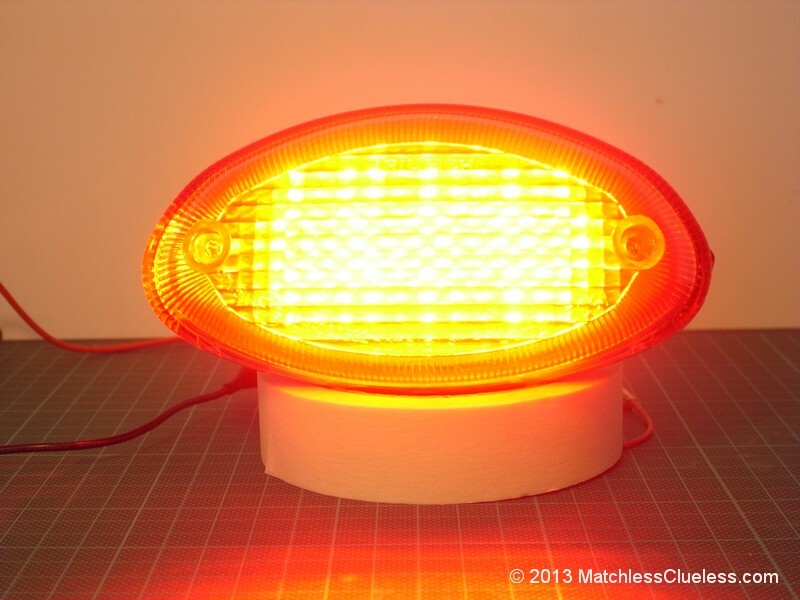 I have both 6 and 12 volt versions of the Lucas 564 style LED light board in stock at the moment, so I look forward to receiving your order! When will these super LED Rear lights be available for purchase again for modern Bonneville bikes? I really want to install one.